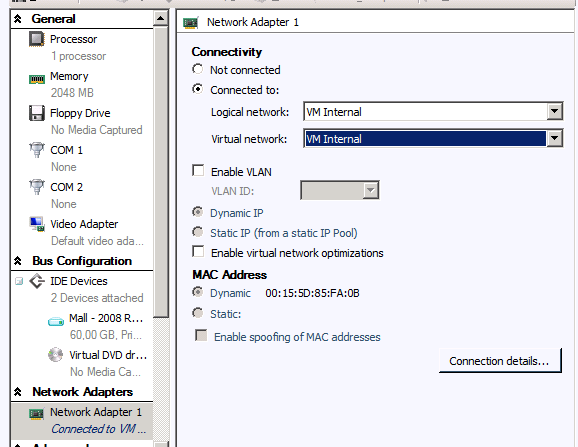 Hyper-V according to me Microsoft Private Cloud and more! Ok, this is a break from the type of posts I’m planning for this blog but since I ran into this just now I thought I’d publish it here just in case some one else finds themselves in the same situation. 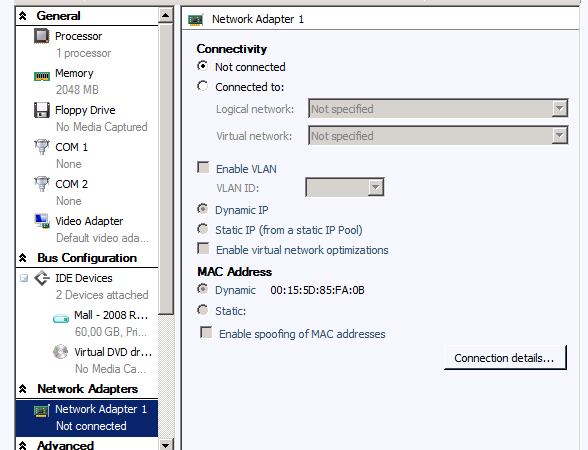 I’ve re-designed the lab at our local office and in the process removed a couple of virtual networks from the Hyper-V environment. Even though I wrote scripts to update the majority of our VMs there were a couple of exceptions I needed to handle manually. 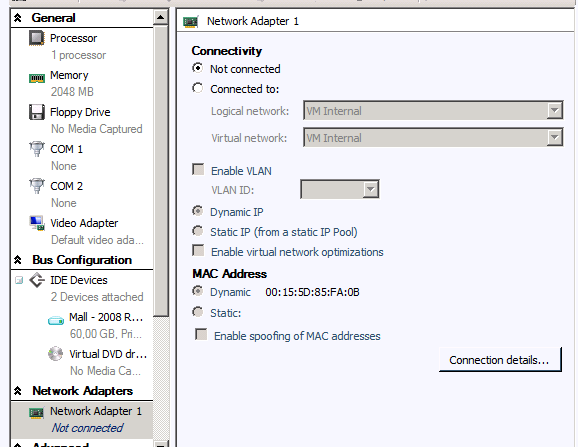 After I’d done this I was able to update the VM without issues. A customer of mine recently asked me why he needed System Center Orchestrator (I believe we’re abbreviating it SCORCH, although I think SCOR is a better homonym (and why is abbreviate a long word?)). In reality he was most likely asking me why he needed automation as he pointed out that if they really needed to automate anything they’d done it 4 years ago with a bunch of PowerShell scripts and a custom made web application. Instead of opening up that can of worms (I’ll gladly do that later though) I’m going to compare SCORCH to his solution. Based on my own rather limited knowledge of SCORCH and the very in-depth knowledge of one of my colleuages I’d say that there are a number of reasons why you should use SCORCH over a home made automation engine. Yeah, I know a lot of you think this should be on the minus side of the equation but to be honest, Microsoft has gotten their act together quite a bit over the years and we all know that they’re in this for the long run. Microsoft have a ton of resources – be it marketing, developers, money or industry klout – so when they have their collective hive mind set on something, they make it happen (see the Xbox as a perfect example). Another reason for this to be in the PRO camp is that Microsoft is responsible for the entire System Center suite, along with Hyper-V, which makes it a lot easier to get all the components to co-operate and even though SCORCH isn’t entirely in sync with the rest of the System Center products, it will be soon enough. Thanks to SCORCH starting out as Opalis and then being bought by Microsoft there is a lot of functionality and connectors that Microsoft probably might not have put in there if they’d written this from scratch. They are, as I mentioned above, getting their act together though and might just have gotten around to it sooner or later but in that case it’d be criminal of them not to focus on their own line-up of products first and then add support for the competitors products a lot further down the line. Easy being relative, of course, but if you compare it to writing everything from scratch SCORCH is a lot easier to get up and running thanks to the plethora of connectors and OOtB functionality you get. SCORCH is powerful and flexible when you need it to be and simple when you don’t. Even though you will be forced to write your own custom scripts from time to time the graphical interface of the editor in SCORCH is hard to beat when designing complex runbooks. In a way at least. Having a graphical overview of your runbook and the scripts, linked together, makes it a lot easier to understand what the heck is going on compared to a folder with a bunch of PowerShell scripts – no matter how intelligently you name the scripts. There are thousands of users of SCORCH that share knowledge and ideas through multiple forums, not the least through Microsofts own channels. Microsoft even provides support themselves if you want to pay for it. This is actually a very important point that ties in with the previous one. SCORCH being an off the shelf product means that any SCORCH consultant knows how it works. Sure, the actual functionality of the runbooks and custom scripts still needs to be figured out but he or she will hit the ground running with SCORCH. Not so with the home built shack of scripts and web applications. On the contrary I’m betting that the consultant that’ll have to figure this solution out will break one or both legs when he or she hits the ground. SCORCH relies a lot on the same technologies as a home made solution does (PowerShell, IIS, etc) so from that point of view we can’t argue that the home made solution is any less future proof than SCORCH but I’d argue that SCORCH as a whole is more future proof. Microsoft is going to evolve SCORCH and in the process they’ll make sure that as many dependencies surrounding it will be evolved as well or at least work with the latest version of SCORCH. They will not care about your own home brewed concoction of scripts and .NET pages. There are of course organisations that don’t use System Center but the majority that do use it would likely benefit from automatization. With the new licensing model you get SCORCH “for free” when you buy System Center so price isn’t an issue either. The only actual negative aspect of running SCORCH is that you need another server for this but as long as you adhere to the private cloud principles, adding another server shouldn’t task your IT department at all. You already own a Datacenter license of Windows Server so if you virtualize your SCORCH server there are no additional cost for licensing either. SCORCH is a very competent, flexible, well designed, interoperational, powerful and reliable automation engine that works exceptionally well with the rest of System Center. The new System center licensing model gives you all System Center products for one price so most larger organisations probably already own SCORCH along with the other System Center applications. Being a Microsoft product there are a ton of consultants that can help you out when needed as well as a large community and professional support options straight from Microsoft. If you’re going to automate – and you are if you know what’s good for you – there’s a very good chance that SCORCH is the best solution for you. My name is Martin Edelius and I work as an IT-consultant with a focus on Hyper-V, System Center and Microsoft Private Cloud. This blog is one way of me sharing my thoughts, ideas and knowledge about these products and solutions.